Click here to join and list your services with the New York Care Planning Council. 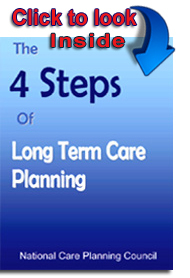 The 4 Steps of Long Term Care Planning is the first planning book of its kind! Filled with references, check sheets, and planning forms, the book guides you in 4 easy steps to creating a plan for you or a loved one's long term care. Used as a text book for University Gerontology courses, the book covers all aspects of long term care resources, both government and private services and gives guidance to finding the resources you need. Normally selling at $24.95, be sure to get your copy at this discounted price.